Spec-Tech Industrial Electric is a stocking distributor of electrical automation products and parts. 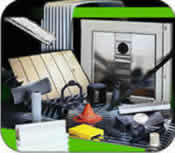 We carry Gortite custom engineered flexible protective covers and Gortrac carrier systems from A & A Manufacturing. A & A Manufacturing Company was founded in 1945 and specialized in developing products from synthetic coating and fabrics. In 1949, A & A began to concentrate their engineering and manufacturing energies on developing flexible protective covers for the machine tool industry. The techniques they developed in the early application of elastomer coated fabrics evolved into today's highly recognized line of dependable Gortite protective covers. Today you'll find Gortite bellows type covers for cylinder rods and shafts, actuating screws, machine ways and linear rails. More recent additions to the Gortite line include Lasertube metal telescoping tubes for use with laser beams, and a variety of custom and stock way wipers and wiper blades for OEM and replacement applications. Multi-axis face shields and bellows for articulated buses and light light rail vehicles complete the product line. The Gortrac Division of A & A Manufacturing Company, Inc. manufactures custom engineered solutions for cable and hose carrier systems. Gortrac was founded in New Berlin, Wisconsin, in the mid 1970's. In 1986, a manufacturing facility was opened in Valparaiso, Indiana to meet the demands of new regions and new industries. Gortrac continues to grow, and maintains a network of customer service representatives nationwide. Spec-Tech is pleased to carry both the Gortite and the Gortrac product lines.